PHUKET: -- Experts speaking at a public forum held in Phuket Town last week have voiced their strong support for Phuket to be designated a “Special Administrative Zone”, saying the move would pave the way to resolving many of Phuket’s long-standing problems. Dr Chantinee Boonchai, assistant to the president for Organization and Collaboration Development at the Prince of Songkla University (Phuket Campus), addressed the crowd of more than 200 attendees at the Phuket Merlin Hotel on June 24. If Phuket were to become a “Special Admin Zone” it would go a long way to help the island’s administrators draw up and implement a long-term plan for sustainable development, he said. The move would allow Phuket – like Pattaya and Bangkok – to elect its own governor and would give local authorities more power in devising and enforcing regulations for local benefit, and allow them greater self-determination in sourcing much-needed funding for public projects. “Phuket has grown so quickly, and many of us have heard about plans for sustainable development for a long time. Also, Phuket has many long-term problems that should be solved and I would like to boost awareness among local people of the need for sustainable development,” Dr Chantinee said. He identified the degradation of natural resources, trash, water pollution and diminishing watershed areas as the top problems to be addressed. 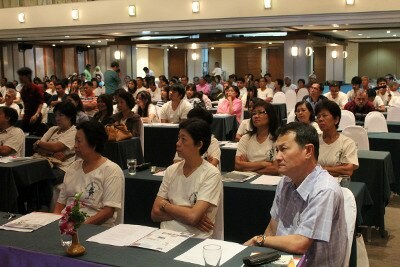 First, the central government needs to urgently transfer the power to manage Phuket to Phuket officials. Second, the government has to distribute enough budget for Phuket authorities to develop the province and solve the problems. Third, the government has to allow all citizens the opportunity to actively take part in the formulation of provincial development plans. Pretty much stating what has been obvious for a long time. I am sure the amount of money generated by Phuket which ends up in the central coffers is not reciprocated in proper proportion due to the fact that money sent to the provinces is based on official population figures. The Phuket authorities have proved that they cannot tackle local mafia and local corruption. They have admitted it. They should not be given yet more power which they cannot / will not use. I'm also suspicious of "experts" that happen to be local businessmen. A mini government within a government that can tax and skim with impunity without bangkok watching? Won't happen because too many hands from bangkok are in the jar already. it would seem the exact opposite of what needs to happen. Local government left unchecked will lay waste to Phuket. It's what they have been doing for years. I'm saddened that you judge me like that.